Le premier septembre 2017, en ouverture pour l’exposition des dessins de Cezanne au Kunstmuseum de Bâle s’est tenu un symposium au programme alléchant, dont les abstracts figurent ci-dessous. S’adresser aux différents auteurs pour obtenir des précisions sur leur communication. Ausgehend von Cézannes Zeichnung nach dem Gemälde La Raie (Der Rochen) von Jean-Siméon Chardin, steht zunächst Cézannes Auseinandersetzung mit diesem Künstler im Mittelpunkt des Interesses. Eine ausführliche Analyse dieser Zeichnung versucht die Qualität der Akzentuierung, der Transformation näher zu bestimmen, die Cézanne in seiner Zeichnung vornimmt. Im Anschluss an dieses Beispiel wird dann die Frage diskutiert, wie das für Cézanne zentrale Phänomen eines Zusammenhangs der Dinge, das bisher in der Literatur als ‚strukturelle Korrespondenz’ oder als ‚atmosphärischer Effekt’ beschrieben wird, begrifflich zu fassen ist. Cézanne’s many-faceted process of drawing was frequently tied to the many other sheets of paper floating in and out of his studio. These included mass-media imagery like fashion plates, reproductive prints from art journals, photographs, and even bottle labels, which, from time to time, he would turn over to use as paper for his drawings or copy directly into his own image repertoire. This talk analyzes the often downplayed import of such images within his artistic practice, in order to demonstrate that Cézanne did not merely appreciate their quality and thickness of paper, but also turned their notably sensationalist themes frequently into his own iconography. The talk devotes itself to the conceptual development of the exhibition Cezanne. Metamorphoses at the Staatliche Kunsthalle Karlsruhe. Cézanne sought to capture the secret and essence of the world around him, phenomena that presented themselves to him as constant metamorphoses of sensory appearances. He registered changes in his natural surroundings with virtually seismographic sensitivity, and translated them into the language of his art. His works are the pictorial expressions of an artistic search that, rather than aspiring towards consummation, circled continuously around his motifs. The exhibition will thus contemplate Cézanne’s œuvre from the perspective of the ongoing process of transformation and transition from one form to another as a basis for elucidating the fundamental structure that distinguishes his works. This approach arises from our conviction that his work phases and motifs are linked by an underlying unity that resists rigid categorization. The exhibition project will endeavour to address this inner interrelatedness. One primary means of doing so will be to break the classical mould of organization according to pictorial genres in order to shed light on the reciprocal relationships between different genres in Cézanne’s work. In sketchbooks we can explore how artists make the world their own. It is interesting to ask how Cézanne’s new vision has changed content and form of his sketchbooks. What is clear is that these are not about the common form of travel journals or the continuous development of ideas for paintings. Cézanne seems to use his sketchbooks arbitrarily, adding individual sketches with great temporal intervals, opening the book from the front and the back, without indicating dates or topographical information, so that generations of art historians are busy trying to seek order. Yet in the alleged messiness of a cézannian sketchbook one can find systematics; a complex web of unconscious memories collected and related. Perhaps Cézanne is one of the first artists to become aware of the power of memories in the process of perception. The sketchbook of Chicago is consulted to exemplify this. 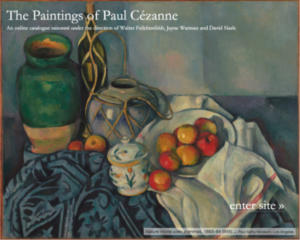 In a larger historical setting and by looking at sketchbooks of Corot, Delacroix, Manet, Degas and Pissarro, the affinities and peculiarities of the reflective drawer Cézanne become obvious. Dans les années 1860, Cézanne crayonna deux dessins, conservés au musée de Bâle, d’après Frenhofer, le héros du Chef-d’œuvre inconnu de Balzac; une trentaine d’années plus tard, dans un album de Confidences, il nomma Frenhofer comme le personnage de roman ou de théâtre qui lui était le plus sympathique. Plus tard encore, à la fin de sa vie, Émile Bernard l’entendit s’identifier silencieusement à Frenhofer. On tâchera d’étudier le motif de cette identification persistante: à la fois dans la recherche impossible de l’absolu en peinture, et dans la théorie et la pratique de cet art. Looking closely at Paul Cézanne’s works on paper is a somewhat confusing endeavor. Besides sketchbooks and full sheets, they consist of an impressive quantity of overwhelmingly heterogeneous bits and pieces with regards to both size and paper quality. However, studying these works as three-dimensional objects facilitates the discovery of new connections. Traces such as watermarks, stains or binding stitches allow seemingly independent drawing to emerge as fragments from sketchbook pages or loose sheets. Exemplary case studies demonstrate that a consideration of the original context reveals a deeper understanding of each individual drawing. A significant number of Paul Cézanne’s drawing sheets include images with thematically disparate subjects that have nevertheless been joined together by subtle compositional analogies. The images are likely to have been drawn on different working days, sometimes separated by lengthy periods. The formal links between the images indicate that Cézanne allowed aspects of whatever came after to be influenced by what came before, as if the independent renderings on the sheet, no matter how many, were maintaining a single rhythm of sensation. Many of the artist’s works in oil on canvas, although representing a unified scene (whether outdoor landscape or indoor still-life or figure composition), join adjacent representational objects within the whole by passages of strokes that seem to distort both elements of the conjunction. Each element appears to “incline” or “bend” toward the form of the other, just as, in the drawings, two subjects on the same page become in some respect alike. If, as Cézanne said, “sensation” was paramount within his art, his felt response to the particular place and moment—wherever he was, wherever he directed his vision—would determine the character of relationships between elements of a composition—whatever would be, whatever the image would become. The same would be true whether “wherever he was” involved a partially filled sheet of figures in a sketchbook or a partially filled canvas of still-life objects in his studio. By generating unforeseen likenesses as a complex image was developing, Cézanne’s working process cumulatively altered the sense of whatever was being represented, perhaps for the artist as much as for potential viewers. Paul Cezanne’s tendency to isolate or “frame” specific drawing compositions in his sketchbook pages offers not only a glimpse into the artist’s thought processes, but also into his working methods. These premières pensées often set forth in black and white what would later be transformed into a painting or watercolor where color became dominant over line.